Discover an attraction of exceptional natural beauty. was born and get blessed according to the ancient myth. 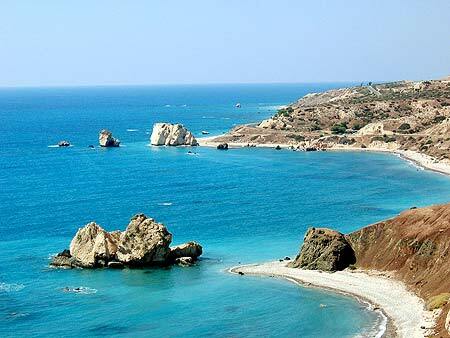 Petra tou Romiou is a beach of exceptional natural beauty, between Paphos and Limassol in Cyprus. It is also known as Aphrodite's Rock. This wonderful beach is connected with Aphrodite, as, according to tradition and the ancient myth, Aphrodite, the Goddess of Love and Beauty, was born here. In the nearby village of Kouklia, there is a temple dedicated to Aphrodite. In the ancient times it was one of the biggest sanctuaries dedicated to Aphrodite. During the celebrations for the goddess visitors from the entire ancient world attended. The ancient myth of the area as Aphrodite’s birthplace, takes us thousands of years back. There is a second legend connected to the area. This legend is from the times that Cyprus was part of the Byzantine empire, some 1700 years back. According to this legend, Digenis Akritas, a mythical hero of the Byzantine era (330 to 1453 B.C. ), was guarding the area from invasions from the Saracens. Saracens were pirates of Arabic origin. Their ships were light and fast and they used to invade for looting in remote areas in the Mediterranean Sea. They were fearless and ferocious fighters. Digenis Akritas was defending this beach from them by throwing on their ships the enormous rocks that can be seen in the sea. Hence, Petra tou Romiou translates to (and means) the Rock of the Greek in English. Tones on bold letters, ou as pronounced in the English word "group". You must definitely take a bath when visiting Aphrodite's rock and its beach, so remember to bring with you your swimming suit. The beach at Petra tou Romiou strand is with pebbles. The sea waters are deep and sometimes rough. When swimming, stay close to the sea shore and enjoy your bath in the crystal clear waters is safety. In order to go to the beach there is a passage under the road. Take the steps down next to the kiosk and go easily to the beach. The passage is stone built and as long as is the width of the road above it. Kind of an experience walking through it. There are many myths and legends about this gorgeous area. Swimming around Aphrodite’s rock three times will bring various blessings says one of them. These blessings include eternal youth and beauty, good luck, fertility and true love. So try it and, who knows, maybe you will be blessed with all these wonderful things! 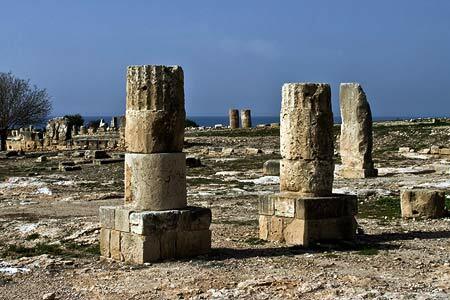 You can visit the area by car from both Paphos and Limassol. 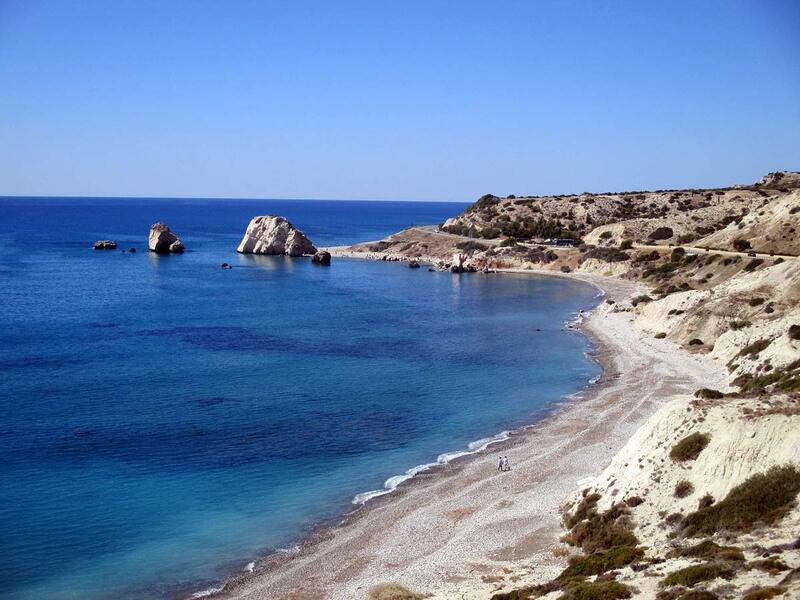 It is a 20 minutes drive / 25 km distance from Paphos and 30 to 35 minutes drive / about 42 km from Limassol. From Paphos, you can also visit the area by bus. 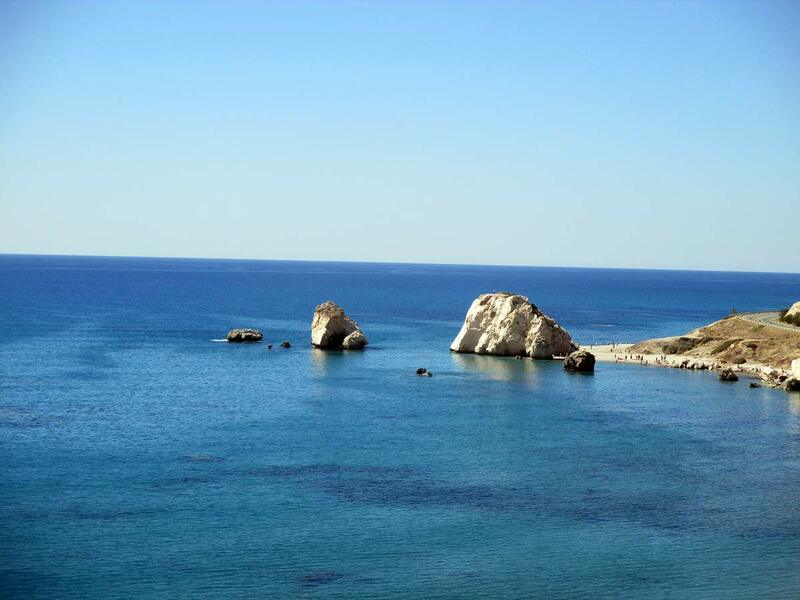 Visiting Petra tou Romiou from Paphos by car, there are two routes. For the first route, take the highway to Limassol. Petra tou Romiou is about 15 to 20 minutes drive. Be careful not to miss the (very big) signs for Petra tou Romiou and take the exit of the highway. The area is about five minutes drive after leaving the highway. A second route is to follow the road from Geroskipou village towards Paphos airport and Petra tou Romiou. This route is a bit longer and might take a bit more to go, but it is a very beautiful route in green surroundings. The road is two directions. It is a good road, not as good as the highway but the beautiful route will compensate for any minuses. This road will take you directly to Petra tou Romiou. For the last four - five km, the road is next to the sea, which you can see on your right. As you drive, you will see Petra tou Romiou in front of you. It will be a big rock in the sea, raising well above the road level. Slow down right away as the parking area is after a left turn and you may loose it. There are also buses which take you there. They start from both Paphos and Kato Paphos areas and for just three Euros you can go and return. Their route will take you through various villages on the way to Aphrodite's rock, which is interesting itself. Find out more about the routes on the website of Paphos buses. In order to visit Aphrodite's Rock from Limassol, you must have your own (or hired) car. Just take the highway to Paphos and drive for about 30 minutes. Pay attention to the road signs, when you will approach the area there are big signs that guide you. Take the exit from the highway and follow the signs again. Petra tou Romiou is 3-4 minutes drive after leaving the motorway. 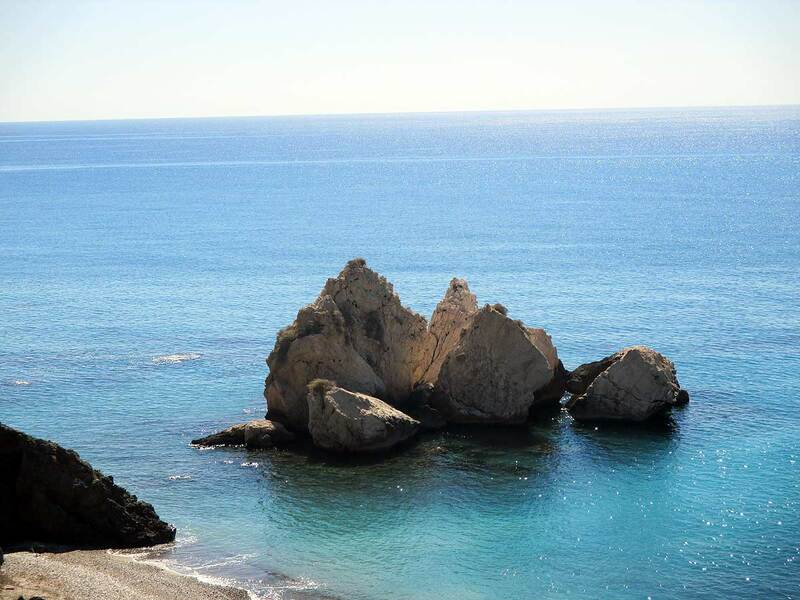 There are two interesting villages near Petra tou Romiou, which you can visit, Kouklia and Pissouri. Kouklia is about 3 km away towards Paphos, while Pissouri is about 3 km away towards Limassol. There is a nature trail for the nature lovers, which you can walk. It is a rather easy to walk trail in a very beautiful area. For the golf lovers, there are two golf courses in the area. There are many good restaurants in both villages, Kouklia and Pissouri. The golf clubs at Aphrodite Hills and Venus Rock, are also options for lunch or dinner. As always and everywhere, the prices at these places are high, expect nothing less than that here as well. Kouklia village is located on an elevated beautiful position, on a hill slope. The view is wonderful, you can see green vegetations in front of you, extending until the sea shore, and the blue of the Mediterranean Sea as background. The village is a very ancient one, and there are many historical ruins. Of them, a visit to the sanctuary of Aphrodite is a must. The central square of the village is very beautiful as well, with stone built roads and many restaurants and coffee shops, where you can sit to eat or just have a drink. Pissouri village is towards Limassol. The village was reknown for its vineyards that surround it and the very delicious grapes they produced. They still produce grapes, although not as many as they used to. The village is divided into two areas. The original village which you face after 4-5 minutes drive, and the area at Pissouri Bay. The village is on steep hills, with narrow roads and nice tavernas and bars. The Pissouri bay area is next to the sea, about 2-3 km from the main village. There are hotels, apartments and villas to stay here. There are, of course, many restaurants, bars and coffee shops as well. You can have a bath or make water sports at the beach of Pissouri Bay. Aphrodite Hills Golf Club is more like a community, with beautiful, expensive villas and apartments surrounding the golf course. At the Golf Club, as we already mentioned, you can sit for food or drink. There is also a five star hotel with the same name, Aphrodite Hills resort, where you can also sit for a drink or food. Just remember that it is an expensive area. Venus Rock golf course was known as Secret Valley Golf. It is a beautiful golf course, in an isolated area close to Petra tou Romiou and Aphrodite Hills golf. It is a very beautiful area to walk and their golf club is available for food or drink. Of course, both golf courses are also available for golf, in case you are a golf lover. It is a linear walking trail, starting at the kiosk near Petra tou Romiou. Being linear, means that you will not finish at the same point as you started, so remember that you will have to return as well. Just walk as much as you like and return back at you wish. If you walk for an hour, you will also need an hour to return, so this makes two hours in total. The nature trail is 7 km long, it takes about 2 to 2,5 hours to walk and it is a Category 1 nature trail. This means that it is an easy to walk trail, with gentle gradient. Category 1 nature trails are suitable for all ages and all states of fitness. The trail follows forest and dirt roads into the Petra tou Romiou national forest park. For most of its way, Petra tou Romiou itself is visible. On the trail you can see many different types of low vegetation and orchids, which are unique. There are also many small animals and lizards. If you are lucky, you will see partridges walking fast and flying and hares running in front of you. The National Forest Park at Petra tou Romiou is located next to the highway connecting Paphos with Limassol, about 10 km from Paphos. It is a project under development and its main goal is to provide to the visitors opportunities for recreation and sports. A second objective is to improve the aesthetics of the area, by upgrading the infrastructure and facilities. The recreation facilities include picnic area, children's playground, nature trail, and sports trail with a cycling track. Reforestation (planting new trees) is also a basic task, to help the forest rejuvenate. For more information and inquiries please call Paphos Divisional Forest Officer, telephone +357 22 94 27 46. There is only one kiosk in the area to buy snacks, water or refreshments. Their prices are towards the high end, so consider taking with you at least water. What is Petra tou Romiou? Petra tou Romiou is a geological formation of rocks in the sea. It is a very beautiful area to visit. There are many myths and legends from the very ancient times connected with the area. Which one is Aphrodite's Rock? Aphrodite's Rock is the biggest of the rocks in the sea, the one that is opposite the kiosk and the parking area.It is into the sea, but a small piece of it lies on the beach of Petra tou Romiou. How far is Petra tou Romiou from Paphos? The distance from Paphos is about 25 km. How far is Petra tou Romiou from Limassol?